Large vacation house on sand beach. Miles of beautiful beaches for walking! Clear blue Lake Michigan shore front, great for swimming! Ideal for families or large group get-togethers. Family room with large dining table, sofa, TV with DVD, and stereo system. Great room with sofa, table and chairs, and kitchenette. Sun room. Large deck/balcony on second floor. Large bunk room - 4 bunk beds sleeps 8. One bedroom with king bed. Two bedrooms with two twin beds each. 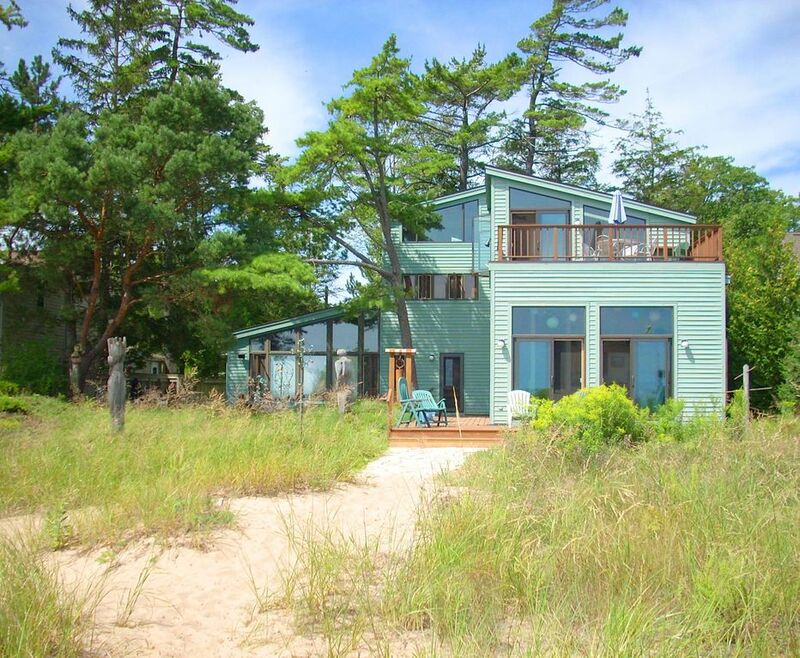 Centered on Whitefish Bay, Door County close to Whitefish Bay Dunes Park and Cave Point Park. High summer week rentals are Sunday to Sunday. Truly a one of a kind experience at this beautiful home. Comfortably slept all 12 of our guests. Interior decorating was stunning with all the unique art work. We had everything we needed. Owner quickly responded when we had a question. Would look into booking this lovely home again! My friends and I really enjoyed our stay at the Kaftan Cottage. It is a beautiful property and is easily accessed, yet in a quiet spot. We had plenty of room and it still felt like home. Easy access to the rest of Door County's fun. Niki and her family are also very good to work with. Highly recommend! What a wonderful place to share! Loved our time here. Thank you! We are so glad you enjoyed the place. Our family of 10 stayed here for a week. Wonderful family home, did not feel like a rental. Bunk room for the kids. Great beach and we had great weather. Thank you for your review! We are so you enjoyed your stay. We stayed here, recently, for my sister's bachelorette weekend getaway. The house was perfect for our group, with plenty of beds and lots of spaces to gather as a group. Beyond that, it is an aesthetically impressive house, filled with art and character. Since the weather wasn't at its best, we spent a lot of time inside, but could still appreciate the sights and sounds of the lake. It was also conveniently close to a handful of wineries, which we didn't mind at all! Thank you for a most enjoyable experience! Thank for your review! We are so glad that you enjoyed your stay. A perfect end to the summer. Where to begin with Kaftan Cottage... in a word, our stay was fantastic. I had been planning a long family weekend away for over a month, and our plans for weekend in the Dells fell through. Luckily, at the instance of my sister, I changed courses to look in Door County and to my surprise, found Kaftan Cottage. The owner was gracious enough to work with us on extremely short notice to put this getaway together. The end result was a memorable weekend, capped with my mother's birthday. What I love about the house is the character and the charm. A lot of times these rentals feel like you're staying in a hotel, but the gives you the impression this is a family's home away from home. The layout of the house was very cool too. Walking around gives one the impression the house is introducing itself to you one room at a time. The vistas onto the lake where beautiful at all times of the day, and all of the interesting wooden sculptures around the property added to the summer vibe. The private stretch of beach was wonderful and pristine. The only drawback was the lake never being warmer than "cold" but that's Lake Michigan. In our short stay we managed to use most of the features of the house, the beach, the firepit, as well as just enjoying the relaxing sounds of the waves in the seasonal porch/living room. The only thing I would have changed about our trip was to make our stay longer. Thank you for a great experience, I hope to return very soon.